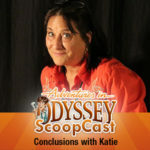 The Odyssey ScoopCast continues with its Album 57 review series. Happy Thanksgiving from your friends at The Odyssey Scoop! The podcast team reviews Adventures in Odyssey Album 57 with the episode “Repent After Me”. Kevin, Garrett, and Ryan discuss the character of Barrett Jones, character development, and mysteries in Odyssey.